The basic setup was very simple and would flow well for someone that is not too familiar with the Nintendo DS interface. "Multiplayer" is right on the first (main) menu screen. Opening credits are long, but not egregious. Download time is average. Tappable areas are appropriately large with matching buffer zone sizes. Play control in Imagine Teacher should be very simple, and it would be, except for the fact that the game demands perfection. In Reading, you have to circle words, but if you slip up at all (tapping the screen an extra time, drawing the circle so close to the top or bottom of the screen that you have to start over), you are penalized. The same thing occurs with handwriting in Arithmetic (the game is actually really good about interpreting handwriting, but still very specific) and History (you really havge to be careful when lifting the stylus), but Reading is worse by far. In Pottery, the task involves repeatedly drawn lines, first left-to-right and then alternating up and down. The problem here is that the left-to-right lines can be almost totally thwarted is the stylus touches the screen while moving back to the left for another line, the up and down lines also really don't feel right (why would this riaise the clay? ), and neither does dragging and dropping a pattern to paint a vase. The game's look is a stylized animation and looks good, but the sound (slowly repeating elevator music with occasional sound effects) is unnecessary and can be turned off. In the game, there are four activities, none of which measure what they're supposed to. Reading measures your ability to locate letters in words on the screen (not names of pictures, but spelled-out words). Arithmetic measures your ability to count to a single digit number, but then will rely on handwriting in interpreting the answer. The History activity is the closest activity to sticking to its intent, but the challenge is in interpreting what some of the pictures are more so than in dragging and dropping them. Finally, in pottery, the game measures your ability to repeatedly draw lines, which has nothing to do with basic pottery. Most pottery wheels aren't spun by hand any more and moving your hands repeatedly up and down won't properly shape anything; specific movements shape the pottery. The pottery activity is the furthest from reality and goes so far as to actually misinform players about what it's like to make pottery. I want to start with two disclaimers I've used before. First, I only review the multiplayer aspect (specifically, the Single-Card Download portions) or the games featured on this site. Second, when it comes to games targeted specifically to girls, I'm not the target audience, so please take my opinions exactly as they are -- opinions. Reading: You're searching for words with a letter, but THE WORDS ARE SPELLED OUT FOR YOU! That's not reading, that's a scavenger hunt. Arithmetic: You're counting. Arithmetic is "the method or process of computation with figures" (dictionary.reference.com). This is counting and, to a small degree, handwriting. History: You're sorting pictures between time periods. Why is fire from Pre-History, but not in the Middle Ages or Present Day also? It seems to me that the Single-Card Download multiplayer was slapped on at the last moment, and poorly so. Here's a message to game developers: having Single-Card Download features in a game is wonderful and fantastic, but only if it has merit, value, and/or a positive play experience attached. Design: Make the pictures clear enough to easily interpret. 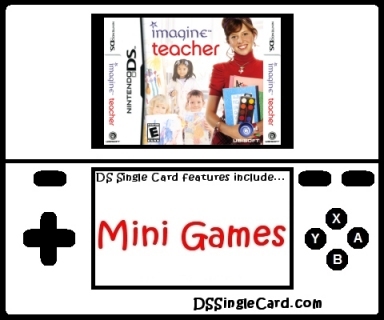 Click here to return to the DSSingleCard.com Imagine Teacher profile.